This broadside signed by J. H. Lane was addressed "to the legal voters of Kansas Territory." It contained a great deal of free state rhetoric about the failure of the territorial government. 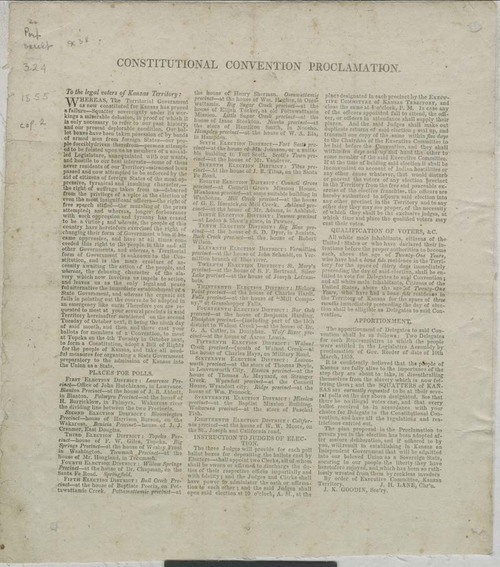 The proclamation was issued in support of the elections that were to be held by the Topeka Movement to elect delegates to a constitutional convention. This document listed the polling places, instructions to elections judges and qualification for legal voters. J. K. Goodin was listed as secretary.